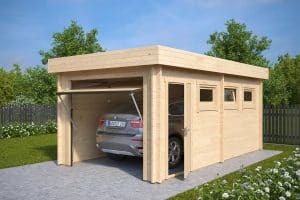 Wooden Garage: An Inexpensive and Stylish Haven for Your Car! Wooden DIY garden buildings are the most affordable garden buildings and have the quickest assembly time. A wide range of models and many different design options, offer something for everybody when looking for a timber structure. Wood is also a very envirmonentally friendly building material, since it is a 100% renenewable source from nature. People in the northern countries, where the best wood comes from, love and take good care of their forests. Millions of new trees are planted each year to keep the earth green and preserve the forests for coming generations. 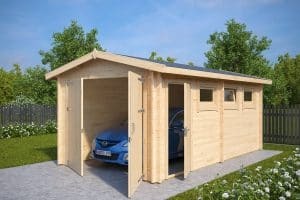 In the next few paragraphs we would like to point out a few of our favourite things about wooden garages, which have made them so popular in Germany, UK, Switzerland and Austria. A self assembly flat pack log cabin is the most affordable and fastest way to build your own garage. 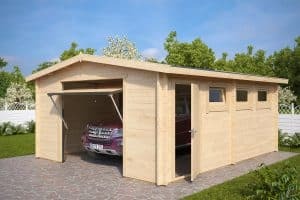 Prices for decent log garages with at least 44mm wall thickness start from £3000-£3500. This is the minimum to get all necessary components delivered. Additionally you need a proper concrete base and you may consider a professional installation service depending on your DIY skills and available time. The cost of a proper base, including materials and labour is around £1400-£2000 and using professionals to get your log garage installed will cost approximatley £800-£1200. 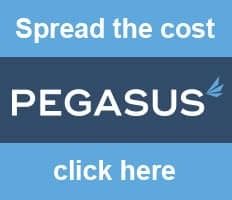 Taking in to consideration all the above options, meaning that all you do is order your choice of garage and leave everything else to professional tradesmen, you can still have your garage built within a £6000 budget. Installing a log cabin does not require special skills. If you are capable of assembling IKEA home furniture or you have a little experience in doing easy DIY projects in your garden, you should be able to assemble your log garage yourself. Building a log cabin garage involves mostly putting together wooden components according to the plan, attaching ready-made windows and doors, nailing roof boards, fixing some details with screws and few other things. You can find really useful assembly videos on many YouTube channels as well. Installing a 3x5m or 4x5m log garage for 2 adults, without rushing should not take more than 2-3 days. 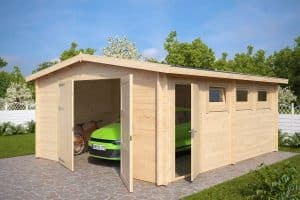 A professional assembly team can install a wooden garage within a day or even faster. 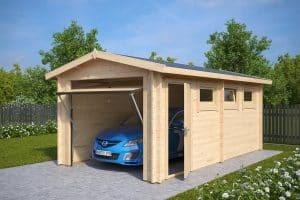 The cool thing about timber garages is that there is so much more that you can do after it has been built. Log cabins give you the flexibility to use one or several colours. Coating walls with one color and using different colors for window frames, parapets, doors and other small components could give a really great effect. Hanging some flowers or plants, using any other decorations and finishing the design with your favorite colored roofing shingles will uprgrade its outer look and make it your very own style. Be creative and do it with love and care! One wooden garage can serve several needs in your garden. Take a standard 3x5m garage which has space for your treasured vehicle as well as some room left over for storing your garden essentials. If you have room and a little extra budget, just a few extra hundred pounds and you can aquire a much wider garage, 4m or even 4,5m. This will give you 1,5m space on both sides of the vehicle, allowing plenty of room for storage and even setting up a small corner for your DIY projects. A double garage would double up the space and costs only £1000-£1500 more than a standard garage. If you happen to have plenty of space in your garden to build a double garage, then this option is worth considering. The other half is commonly used for the second car, but may also be used for storage, DIY projects, table tennis or even turned into a teenager cave! Then there are garage and carport combined log cabins. The carport half of the building is also very useful to keep your garden furniture and bikes away from bad weather and a safe place to prepare BBQ meals whether it is raining or even snowing outside. Wood has always been a widely used building material and will always be. Nowadays, wood processing technologies have made wooden buildings more affordable, easier to build and enable log cabin producers to offer a really wide range of models suitable for many different tastes and needs. This is one of the biggest reasons why log cabins are gaining more and more popularity. Finally, there is no other building material that gives you such a close to nature feeling, smell fabulous as well as make you feel warm and cozy, no matter if it is a garden room, summer house, garden office, shed or garage.